This estate is obviously very well known amongst those who frequent the dessert category and are constantly drooling over the prospect of purchasing their next bottle of Sauternes....... (oops, that tis' I). 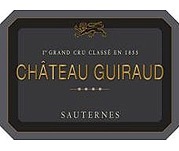 Chateau Guiraud is among the classified growths of 1855 and holds a place in the "Primer Cru" category along with ten other estates. It maybe worthy of note that it was the 9th best wine during this classification, which when you subtract Yquem from the equation, it really means Guiraud placed 8th amongst the eleven primer cru wines. This wine is composed of 65% Semillon and 35% Sauvignon Blanc and it was aged in barrel for a total of 24 months. The average age of the vines is 35-40 years. The average yield is 12hl/ha. The maximum yield allowed by the appellation is25hl/ha. On the nose I get brilliant aromas of creme brulee, orange creamsickle, honey, nutmeg, and a touch of white peach. I don't detect a great deal of botrytis spice, which to be perfectly honest isn't a deal breaker, but something that maybe has to do with the high amount of S.B. in this wine. On the palate the wine continues to display it's incredible creaminess and flavors that resemble creme brulee, orange creamsickle, almond butter, and just a faint hint of spice. It has a very smooth and seductive quality to it that slides across the tongue like a silk ribbon, then on the finish a creamy nuttiness and a kick of acid settles in.